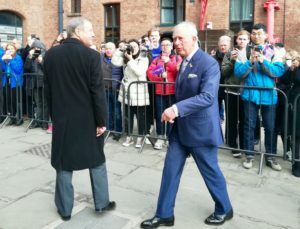 HRH Prince Charles visited the Royal Albert Dock today to celebrate its new status ahead of its 175th anniversary in 2021, forming part of a trip to Liverpool with the Duchess of Cornwall. The Prince of Wales, alongside wife Camilla, began his tour by attending a reception at the University of Liverpool with Irish President Michael Higgins to celebrate their joint patronage of the Liverpool Institute of Irish Studies. He also visited St George’s Hall to view renovations and to meet Nelson Mandela’s daughter, Dr Makaziwe Mandela, who has donated her father’s paintings to the hall. From there it was down to the waterfront for an inspection of the Royal Albert Dock, more than 30 years since the Prince himself opened the regenerated site back in May 1988. In the 1970s and early 80s, the area was abandoned and derelict until work began in 1982 to refurbish it. 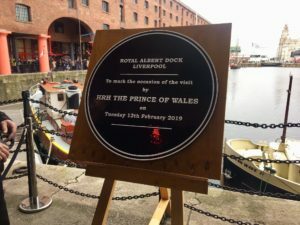 In April 2018, the docks received ‘royal’ status from The Queen after being recognised for its historical and architectural significance to the city. The future King walked through the crowds at The Beatles Story entrance, greeting staff and spectators as he passed. He was met by chairman of the board of directors, Dave Roscoe, and the chief executive of Royal Albert Dock Liverpool, Sue Grindrod, who showed him around the Grade I site. Mary Chadwick, general manager commercial at The Beatles Story, told JMU Journalism: “I think it is really good that the Albert Dock has royal status. The Prince of Wales took in a range of businesses as he strolled along the waterfront, including Leather Satchel Co, the Nest and Lunyalita. He also spoke to representatives of the Royal Albert Dock Liverpool Charity Foundation, who use the valuable qualities of the area to benefit locals. Terry and Lorraine Clark were at the docks during the Prince of Wales’ trip, but were unaware about his arrival. The couple, who have been visiting Liverpool for the past couple of days, both thought that the docks deserved its royal recognition. 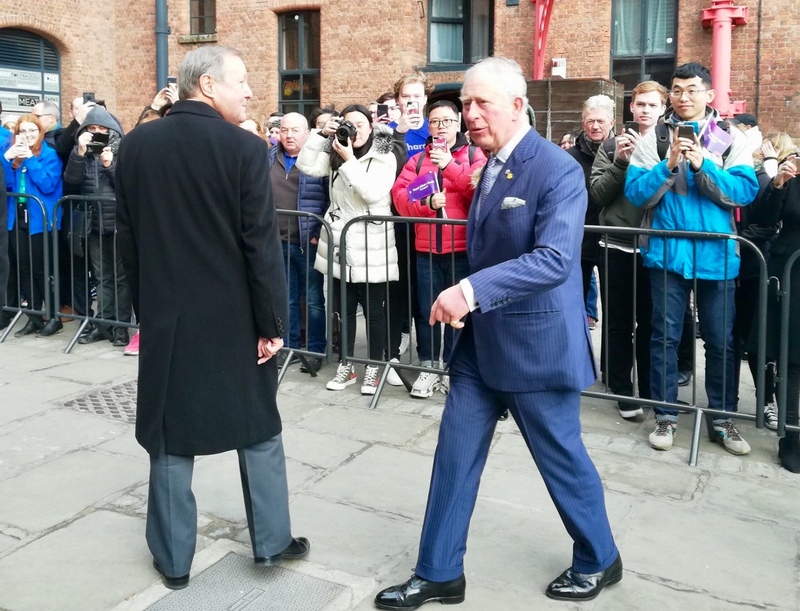 To end his visit, Charles was taken past Tate Liverpool and was shown the giant sculpture outside before heading to a special tour of the International Slavery Museum. On his exit from the historical building, large crowds gathered to cheer him on and wish him well as he made his departure.